Advance Beauty College proudly serves its community, valuing the education of its students as they pursue careers in the competitive beauty industry. Beginning as a solid family business, the Orange County beauty college just nominated for commitment to education, offers courses with up to date techniques as well as events such as career fairs that provide students with experiences that will take them one step closer to their dream job. Recently, Advance Beauty College was recognized by the Center for Family Business for an active involvement in the education of their students. The Orange County beauty college was nominated for “Commitment to education,” an award given annually by the center. On March 15, the orange county beauty college was incredibly honored to receive the “Commitment to Education” Award. Supporting family businesses in Orange County since 1995, Cal State Fullerton’s Center for Family Business began as a resource for family businesses from helping them find solutions to common problems and teaching top business practices to incorporating education to help such businesses develop and improve while maintaining the family unit. For years, the incredible organization has successfully facilitated the success of numerous family businesses. On March 15, at the beautiful Nixon Library, the Center for Family Business held their 2nd annual business hall of fame induction ceremony, presented by City National Bank, award categories included; excellence in community, commitment to education, as well as a family award. Advance Beauty College’s nomination for the Commitment to Education category was an honor the Orange County beauty school will continue to earn. Whether it is providing on campus salons where students can get a feel for the atmosphere of a beauty-related career, or hosting career fairs where students will be introduced to major names and companies in the industry, Advance Beauty College makes student education a priority. The Orange County Beauty College, nominated for commitment to education, emphasizes the importance of education when it comes to succeeding in the beauty industry for both families and individuals. Ensuring every professor, class, or event enhances the education of their students is a major priority for Advance Beauty College. Providing affordable courses and offering assistance in job searches are only some of the ways in which the college supports the education of their students and community. Community is valued by Advance Beauty College, and being recognized in their Orange County community is an honor appreciated by the college. The Orange County Beauty College found out the results when winners were announced at the CSUF Family Business Hall of Fame event, on Tuesday March 15th. The incredible event included some of the best family businesses, many of which have had an exceptional 2-5 generations of their family involved. Companies such as Tabasco, shared their motivational stories. Tabasco, in particular, inspired with their 5-generation family owned business, which keeps traditions alive today, while still experiencing incredible growth. As a family owned business, Advance Beauty College was honored to receive the Family Award. After moving to the United States with nothing but the clothes on their backs and a dream to become the first Vietnamese Beauty School, the parents who started the college as well as subsequent family members have dedicated their lives to growing Advance Beauty College, now the top beauty school in North America. 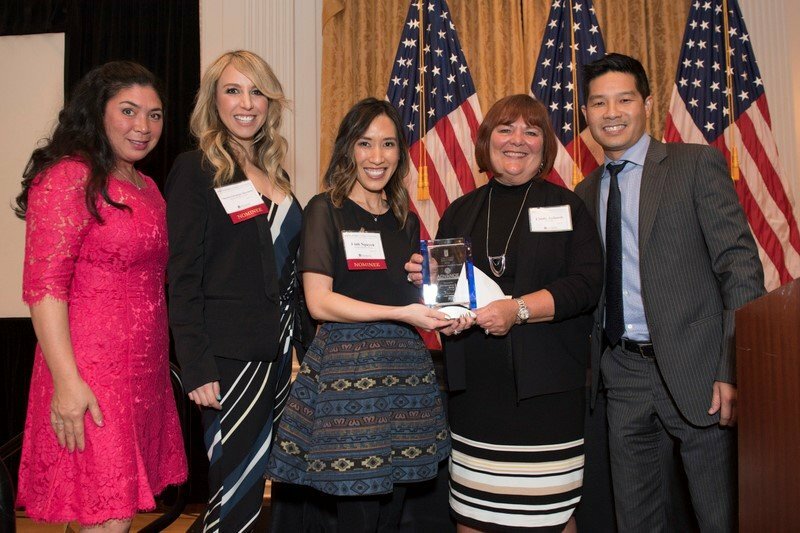 As a family and people focused organization, the team members of Advance Beauty College attending the event all came up on stage to accept the award, including President Tam Nguyen, Vice President Linh Nguyen and Vice President of Business Development, Suzette Christian. Mr. Nguyen made special mention to Ed Hart and Dr. Anil Puri for the opportunity and event by the Center for Family Business. Mr. Nguyen thanked the Advance Team members, who were back at the campus educating others in the beauty profession. “Education is one of our core values”, it was “preached as one of highest pillars”, Mr. Nguyen referenced to his parents, the founder of the orange county beauty school. Both siblings (Tam Nguyen and Linh Nguyen) came to America under tough circumstances, during the Vietnam War. The hard work, the value in education, and what they have done as a pioneer in the nail manicure industry is what attributed to the organization’s success. Tam and Linh’s parents together created one of the first beauty colleges in Little Saigon (Westminister, Ca). Now they are the largest manicuring beauty college in the industry in North America. Please visit https://advancebeautycollege.com/laguna-hills-advance-beauty-college// for more information on the event as well as on the Orange County Beauty College presented with the Center for Family Business’s annual Family Award.